Dom Joly is a multi-award winning British comedian and writer. His smash hit hidden camera series Trigger Happy TV re-defined the genre and was a primetime UK hit – selling to over 80 countries around the world with a spin-off series on Comedy Central USA. He also made World Shut Your Mouth and This is Dom Joly for the BBC and Fool Britannia - a prime-time comedy show for ITV. He recently brought back an updated and brand new series of Trigger Happy to huge acclaim on All4 and Channel 4. He’s currently developing a sitcom (FTK) from his pilot script recently optioned by seasoned comedy producer Mark Freeland at Working Title TV, and sis podcast Earworm (“Staggeringly funny phone calls with a soundscape by Stephen Jones of Babybird”) has topped the comedy charts and just been purchased by Amazon. 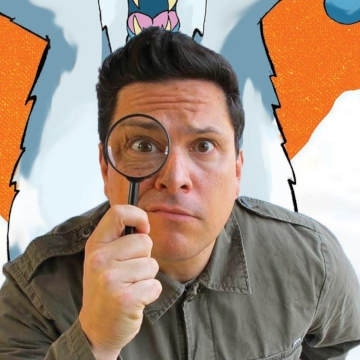 Dom Joly is a former diplomat and political producer turned columnist and award-winning travel writer and has written extensively for the Sunday Times, The Independent, The Mail on Sunday and many, many other newspapers and magazines. And he has adventure in his blood: his latest book The Hezbollah Hiking Club, in which he walks the length of Lebanon with two friends, is out in June.